Diplomonkey utilizing his super-duper street smarts while driving through the bedlam, fondly known as regular Monday morning Lima traffic, turns right and then left to find quick and unobstructed passage. In the process, on a neighborhood backstreet he discovers a hidden rare gem. 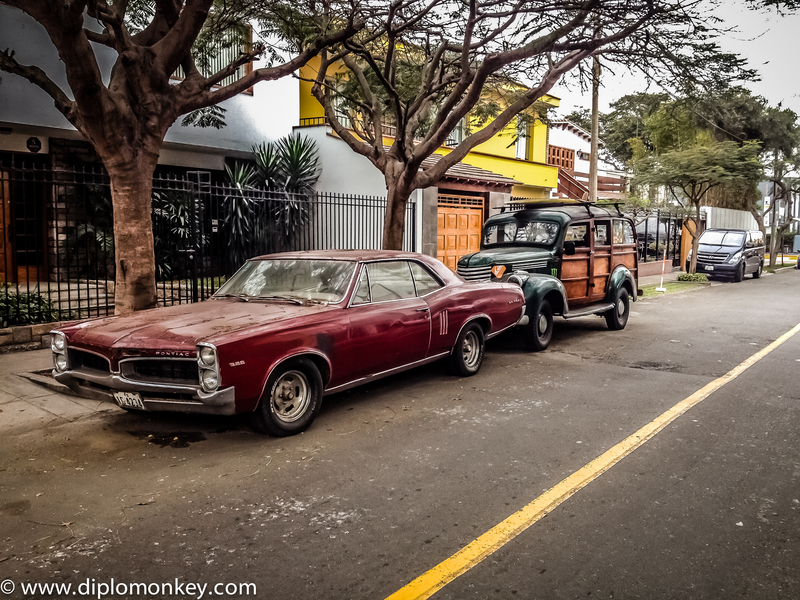 So Diplomonkey dashes out of his aging, and less than trusty jeep, and into the mad traffic with nothing in his hand but his iPhone; wifie gasps, you are nuts – the risk is not worth the picture, get back in the jeep…its just another old truck. 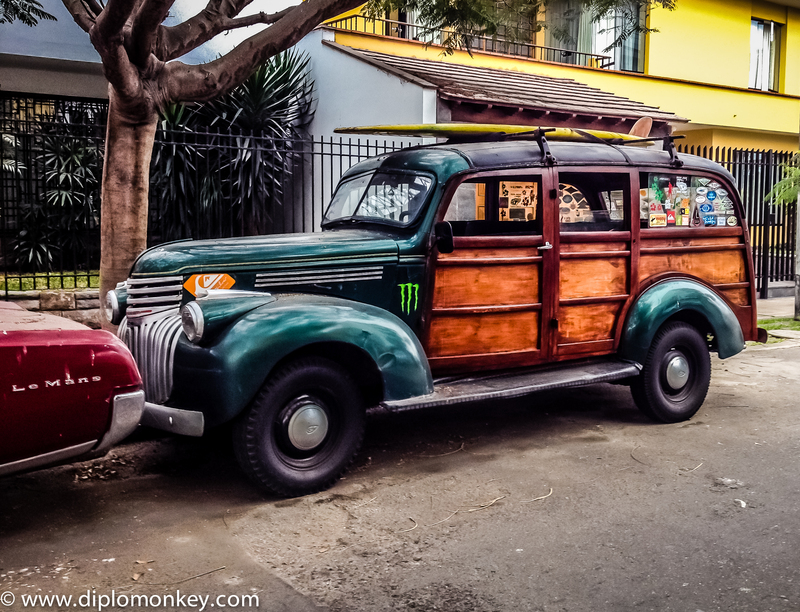 No, it looks like a 1941/42 half ton Chevrolet Campbell Woodie, blares out Diplomonkey. Okay, it was not all that dramatic after all since Diplomonkey safely pulled over to the side, parked the jeep, turn the hazards on, and applied the hand brake and then looked three times before crossing the street. If anything should happen to Diplomoneky, RSO would be so very, very sad – too much paperwork and cables galore. But what a great surprise nonetheless on a Labor Day morning, what a cool story and find. Icing on the cake, or in this case the Alfajor, was the maroon Pontiac Le Mans 326 parked in front of the old Chevy. Ah the unexpected joys and wonders of life in the foreign service life. Who would have thought that you can even have fun while driving in Lima. Enjoy the pictures; they are of relics from a time when vroom, vroom actually meant something…. 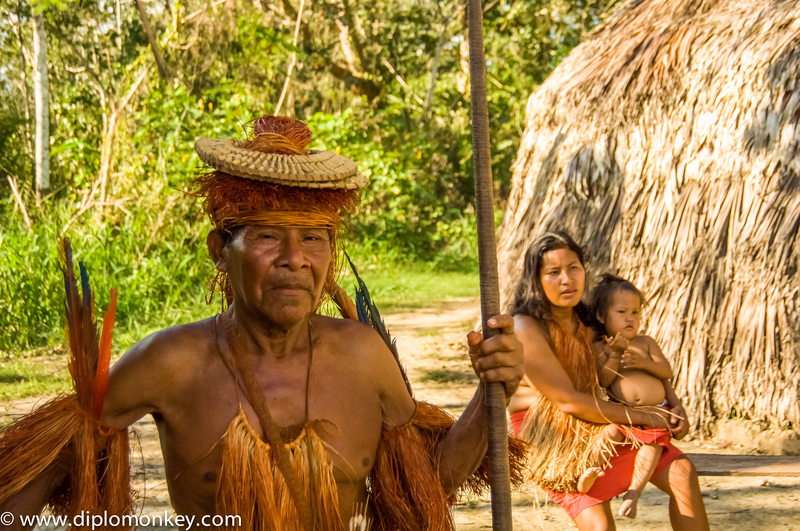 The Diplomonkeys while exploring the Amazon, albeit from the comfort of their jungle lodge base camp, receive an invitation to spend the afternoon with the Yaguas. It’s only a quick 30-minute boat ride down the river to the village, but it is a world away in terms of differences. 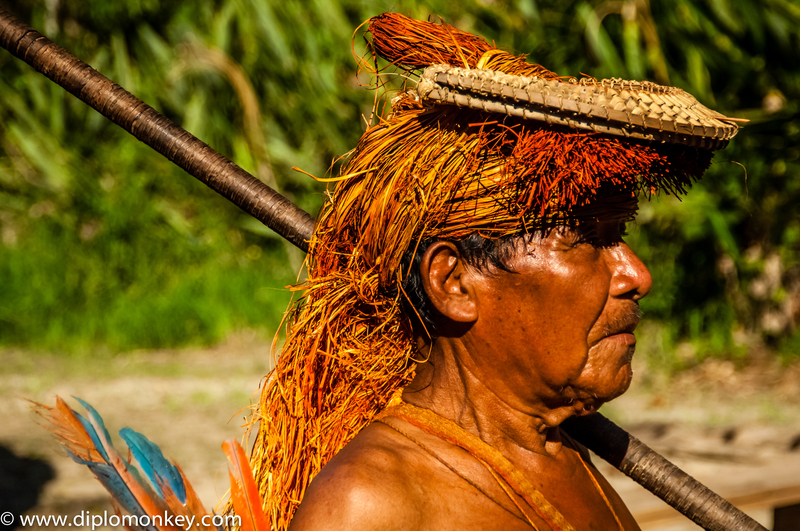 Yagua chief armed with a punaca (blowgun). 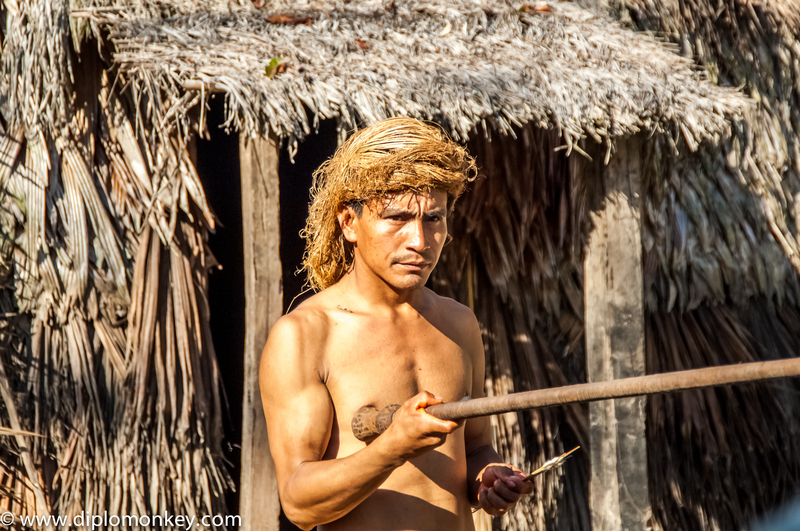 Yagua man armed with a punaca (blowgun). 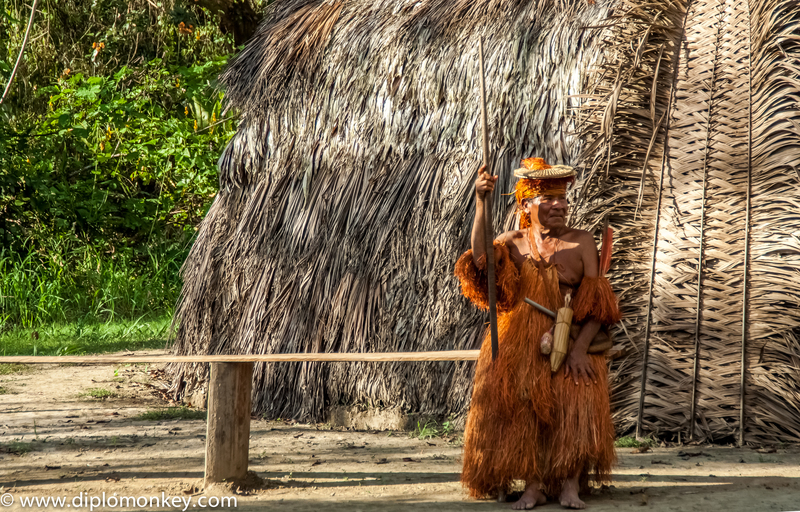 Diplomonkey looks forward to his meeting with one of the thirty or so Yagua communities scattered across Peru’s Amazon basin. Despite the encounter being a programmed activity, it is nonetheless an opportunity for the Diplomonkeys to interact with a people who for millennia have lived off the river and the forest. 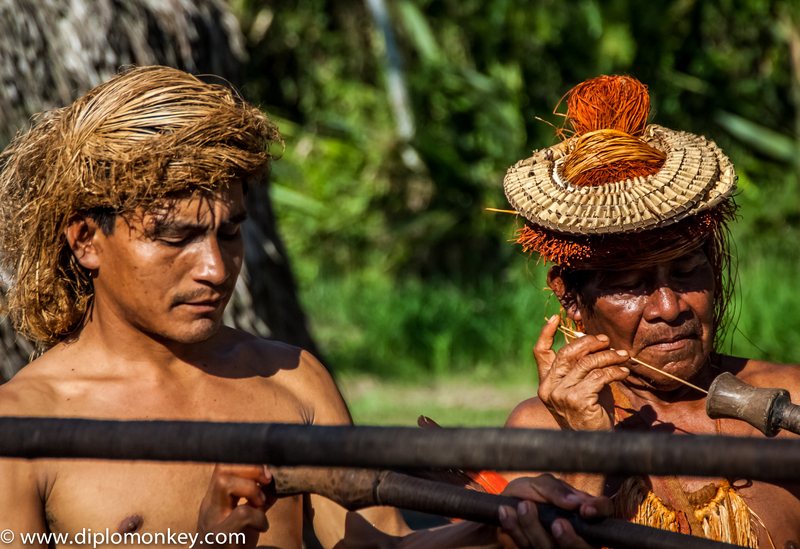 Yaguas preparing a punaca (blowgun) demonstration. An indigenous people, the origin of whose name today appears to come from the Spanish deformation of the Quechua yawar ruba or the “blood-red people,” they are sincere in their welcoming. 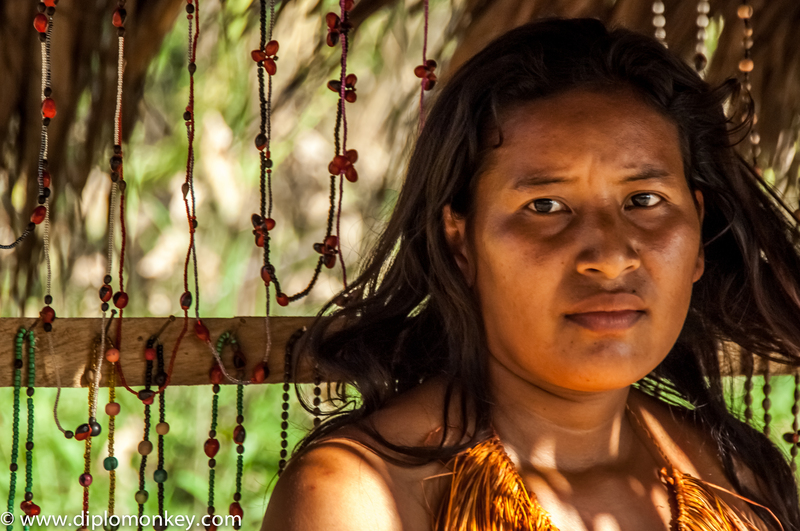 The blood-red people moniker apparently comes from the Yaguas’ habit of painting their faces with achiote (seeds of the annatto plant). 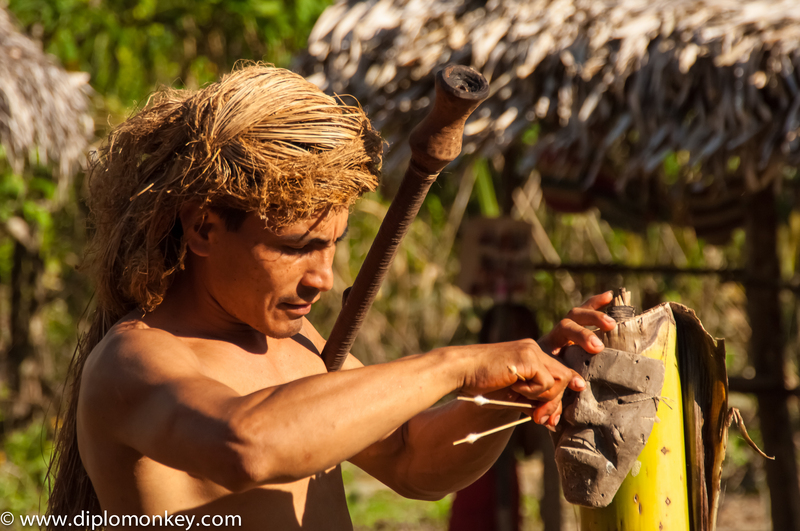 Yagua man pulling darts from a punaca (blowgun) target. How different and special is this Amazon jungle. When compared to the concrete jungle in which we live, Diplomonkey thinks that green jungle is the better of the two. 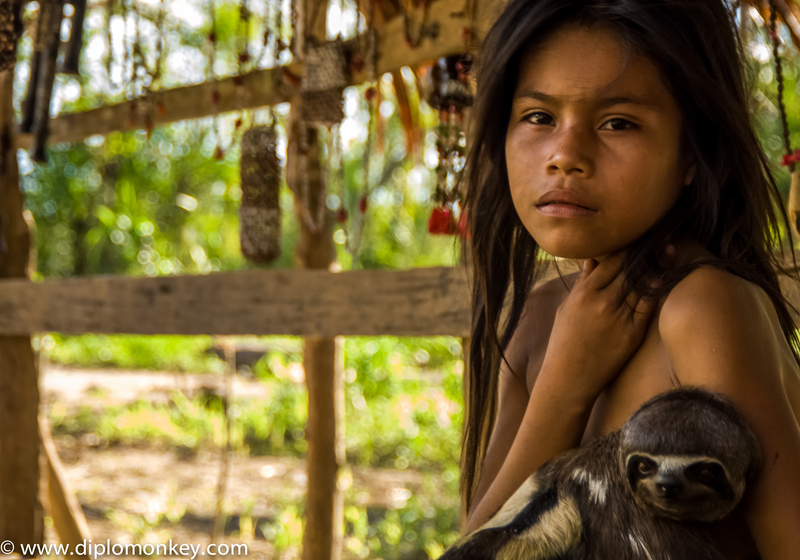 Yagua girl with pet sloth. 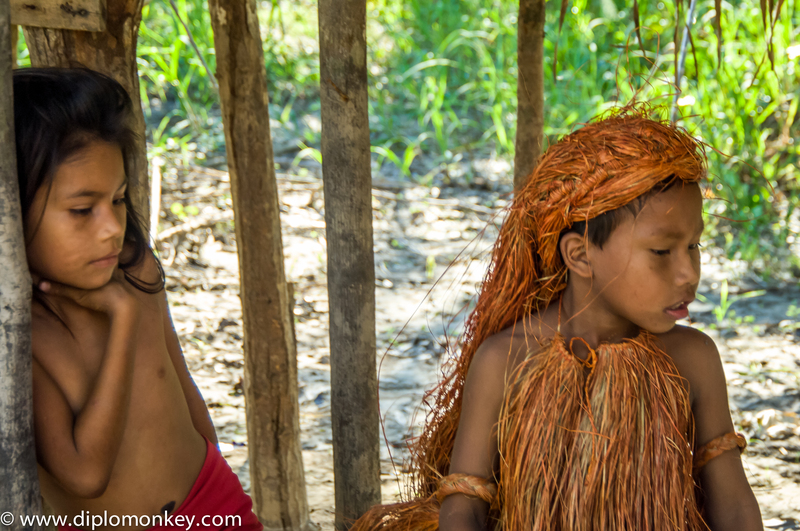 For the little ones, as well as for the parents the Amazon represents spectacular sights, sounds, and even smells. It is a place of torrential downpours followed by gorgeous sunsets along the river. It is a place where the air resonates with the squeaks, squeals, and howls of untold insects, birds, and monkeys. Here the river is stocked with exotic fish and cavorting river dolphins. It is also a place of fresh, clean air characterized that by the welcoming odor of damp earth. Here even a tapir makes its way deftly through our camp in the evening. 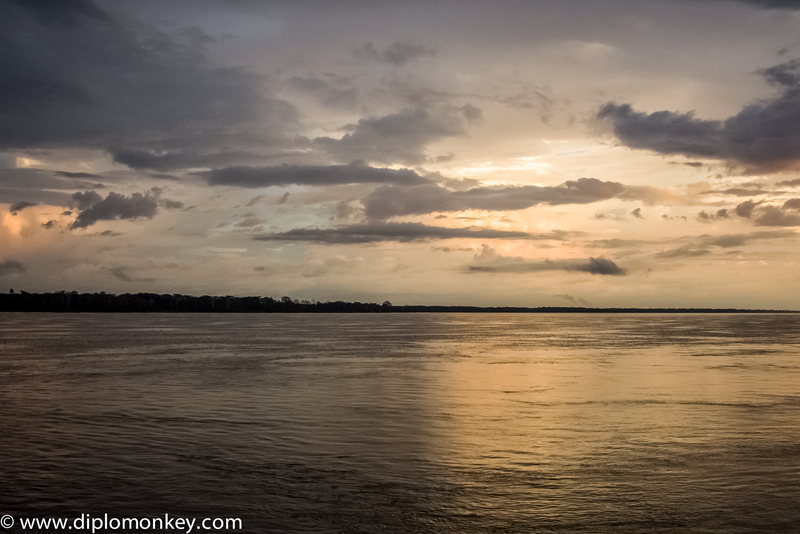 Sunset on the Amazon river. If you can, go and visit the Amazon. The dollars you spend are well spent. We discovered that they offer people an alternative to logging. If not, then try to spend some time in some other jungle of the non-concrete variety. You might be surprised by what is out there. 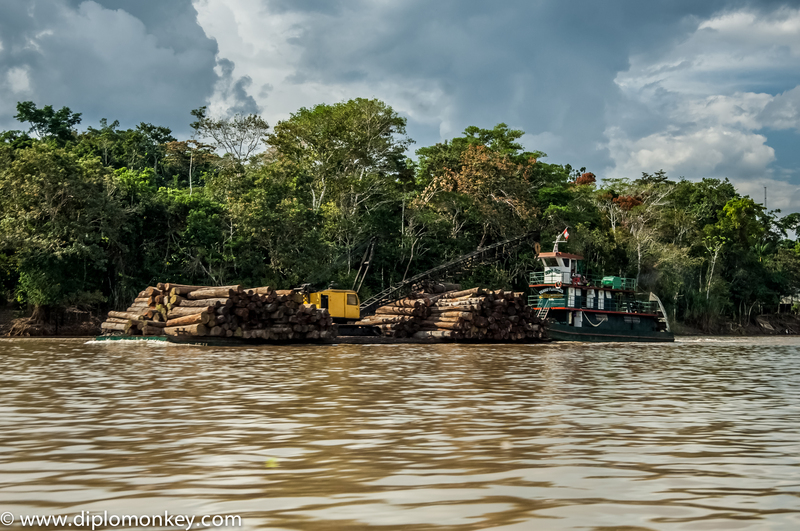 Logging barge running along the Amazon River heading to Iquitos. Okay little Dorothy, so Diplomonkey this time around is cheating with his latest chimping excursion. Diplomonkey took this batch of pictures of Peru’s Iquitos while on leave. Diplomonkey taking time off? Oh how scandalous, I do say little Dorothy – what is this world coming to! 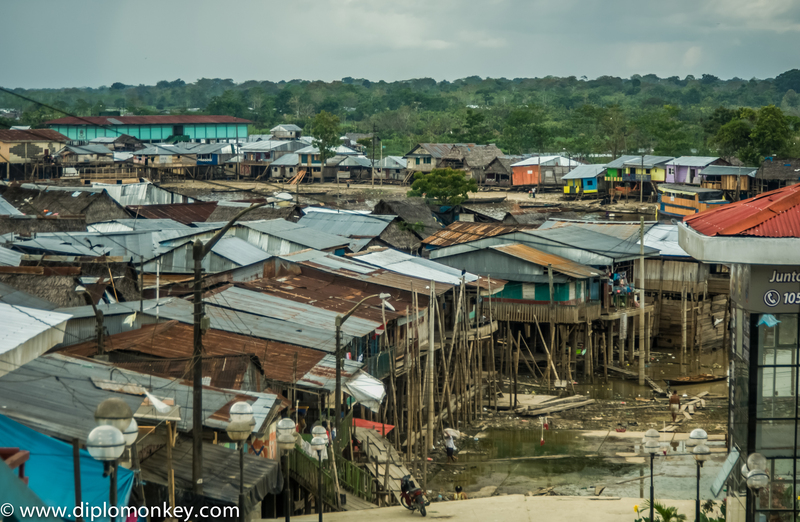 Iquitos’ lively neighborhood of Belen – also known as the Amazon Venice. 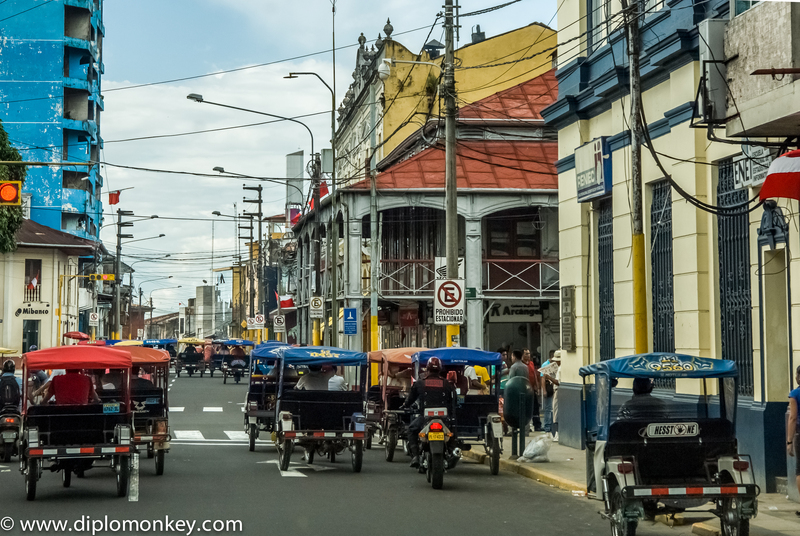 Rushhour in downtown Iquitos (along the Iron House supposedly designed by Gustave Eiffel). 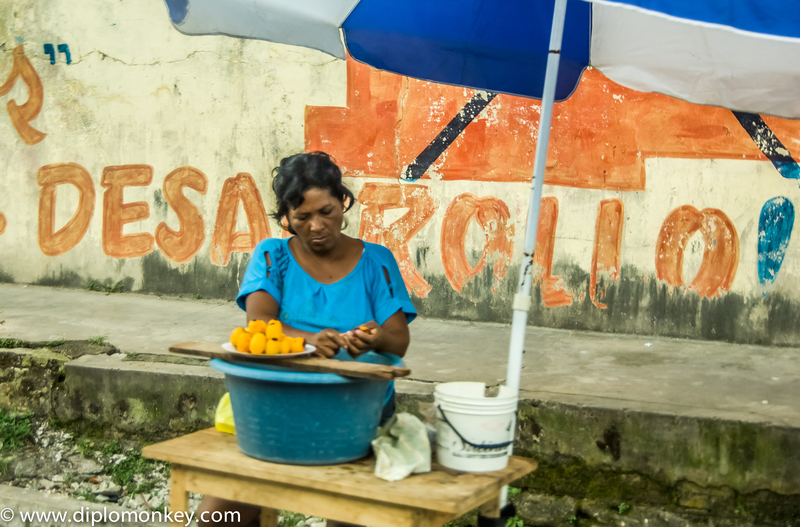 Iquitos is a really cool place to visit. Its hot and humid much like Miami, so Diplomonkey feels right at home. The people are however even nicer; always with a smile on their faces and not in too much of a rush. It seems that the pace of life, much like the Amazon river’s current, runs at 4-6 kilometers per hour. 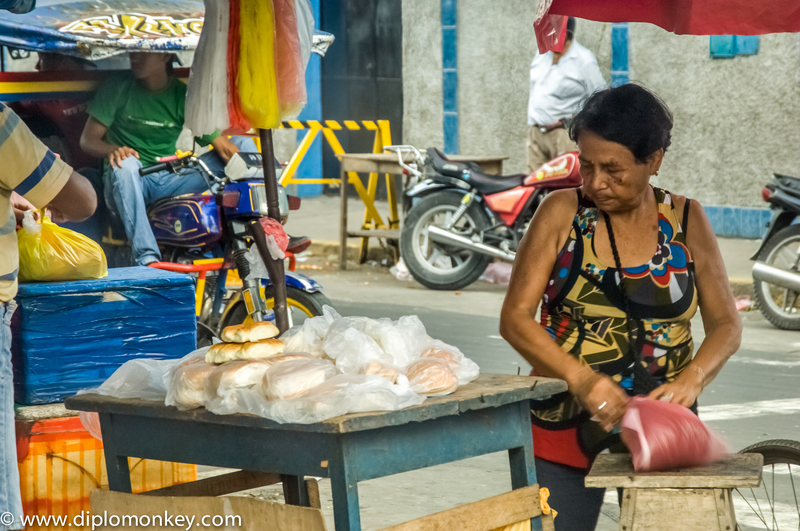 What Diplomonkey find really great about this island city in the middle of the Peruvian Amazon are the street scenes of people engaged in their daily activities. Yes, little Dorothy, Iquitos (capital of Peru’s Amazon) connects to the rest of the country only by air and the river; so if it is not manufactured or grown locally, it has to come in by plane or by boat (Pucallpa is a 4-7 days sail away). There are no roadways in or out of the city linking it with the rest of the country, giving Iquitos a surreal frontier town feel. Hope the pictures entices others to pay a visit. Nothing can beat the smell of oxygen rich air that permeates the city, nor a tropical downpour. 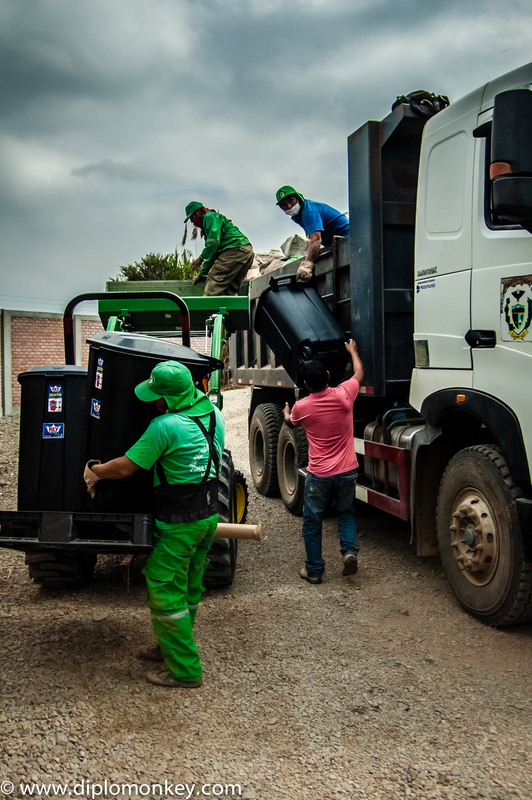 Cheers and more to follow from Peru! 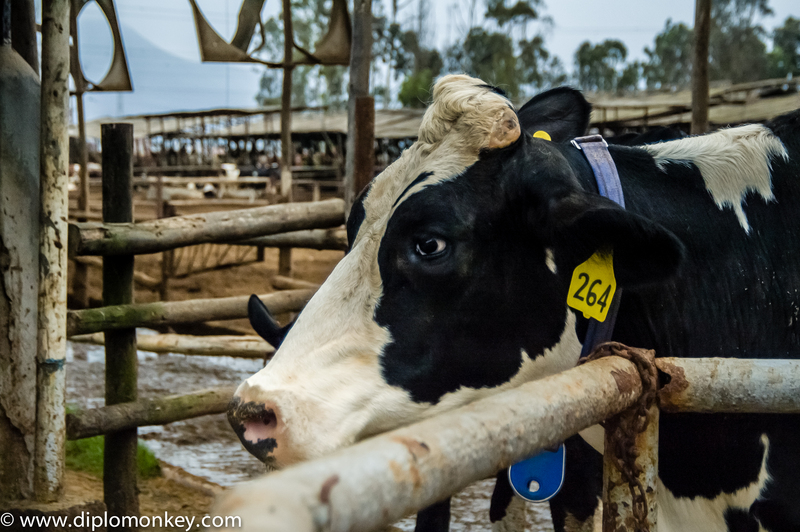 On the road again, Diplomonkey drops by this really cool dairy farm in Lurin, a fair-sized town some 45 kilometers south of Lima. 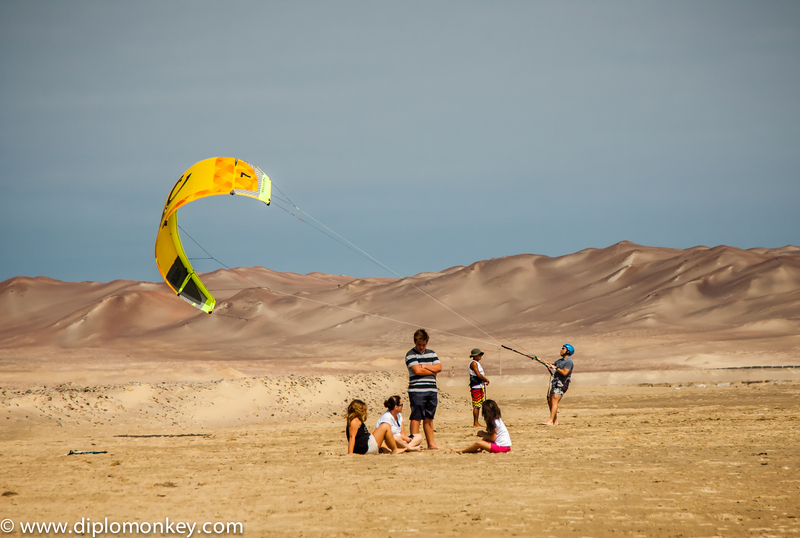 The place is also known for the massive pre-Colombian Pachacamac ruins on its outskirts – note to self, I need to go their with the little dudes before our tour is up next year. 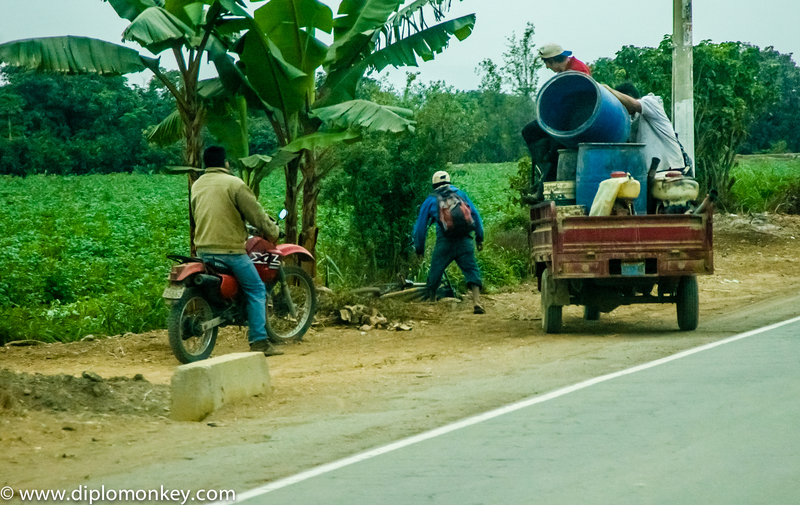 Anyhow, there is nothing like a quick farm visit to cheer up Diplomonkey’s spirits. 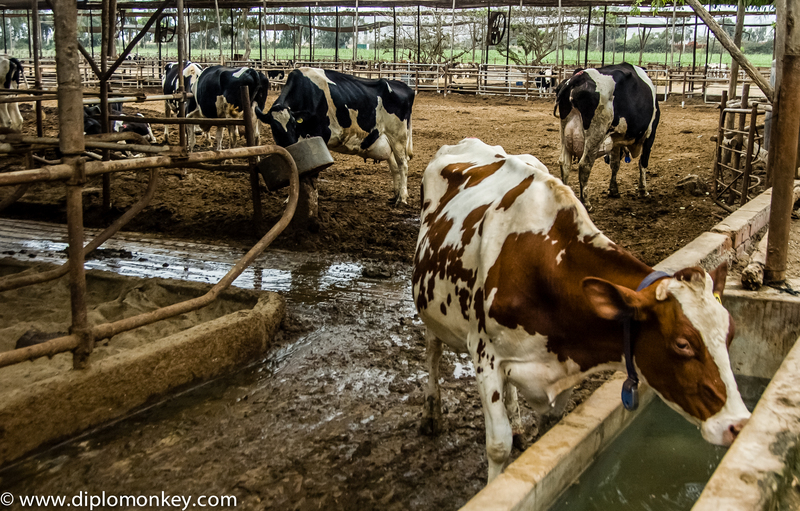 The smell of hundreds of animals, feed, and damp earth are a welcome, reinvigorating shock to the system, as much as an escape from the confines of the office and its unceasing pile of reports and briefing memoranda. One of the great aspects of foreign service life, I think is getting away from the desk work to actually do field work. I guess that the bonus here is the possibility to see new things, as well as to interact with people. Most people I meet are more than willing to tell you something about themselves, what they do, what they think, and how things could better. 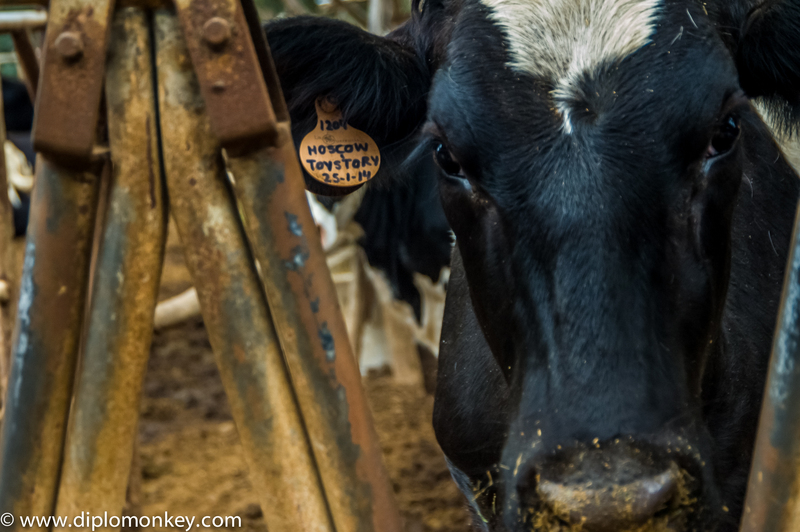 In any case, enjoy the pictures and consider a farm visit sooner than later to learn where our food actually comes from. 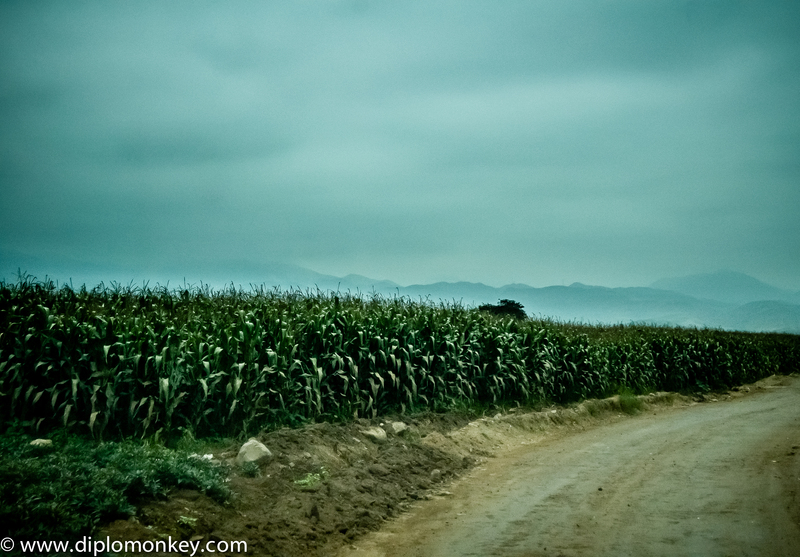 The cool thing about being posted to U.S. Embassy Lima, inspite of the opportunity to engage in some really poor rhyme making, is the possibility to go out and experience the countryside. 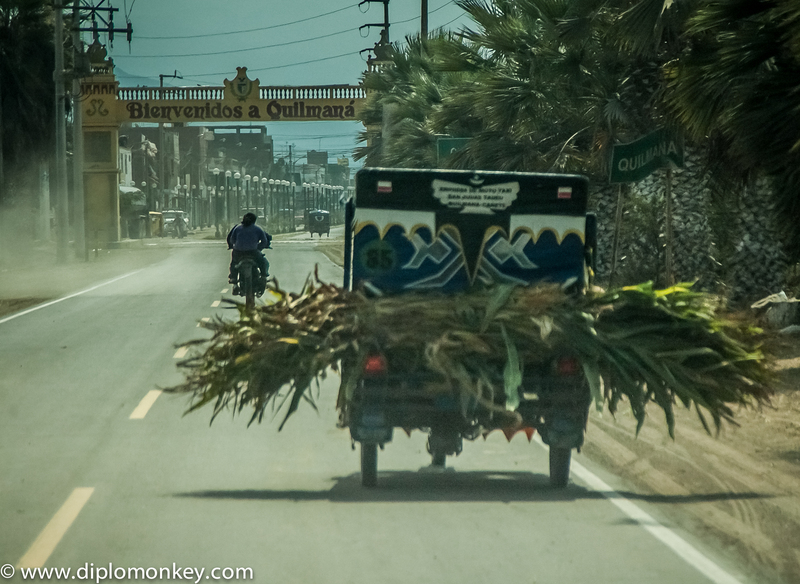 So last week, with the interns in tow, Diplomonkey headed out to Quilmana, Canete about 140 kilometers from Lima on the Pan American South highway (i.e., the Panamericana Sur). Weather clears up a bit, but the fog does linger; which makes for some moody pictures. Sorry no rhyme there. 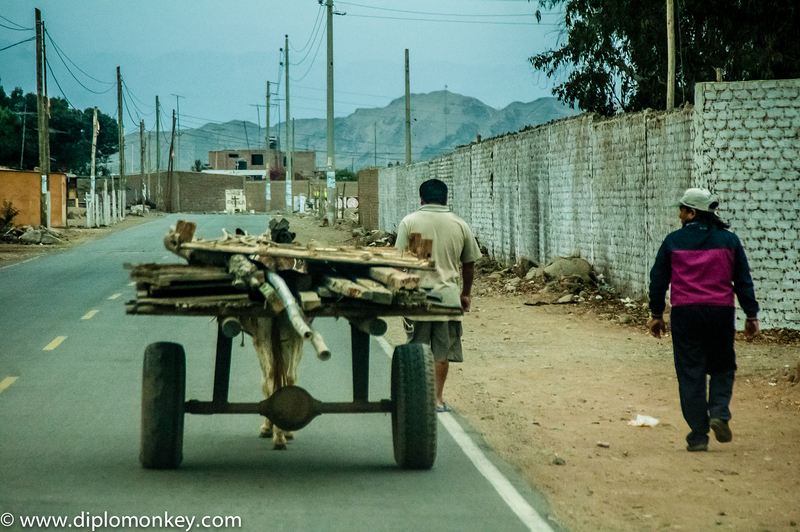 Anyhow enjoy this new series of postcards from Peru. Get out of Lima and see something different. The sun is unseasonably warm; the sky is bluish. 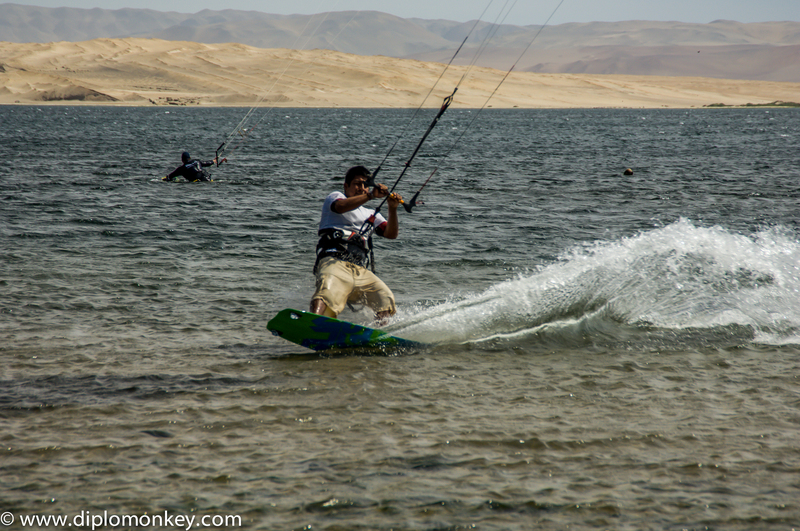 Life is good four hours south of Lima in Paracas thanks to this year’s fickle El Niño. Enjoying some ceviche, washed down with some sweet dark beer followed by a Chilcano along with some Afro-Peruvian cajon music in the background; ah life is good in Peru. 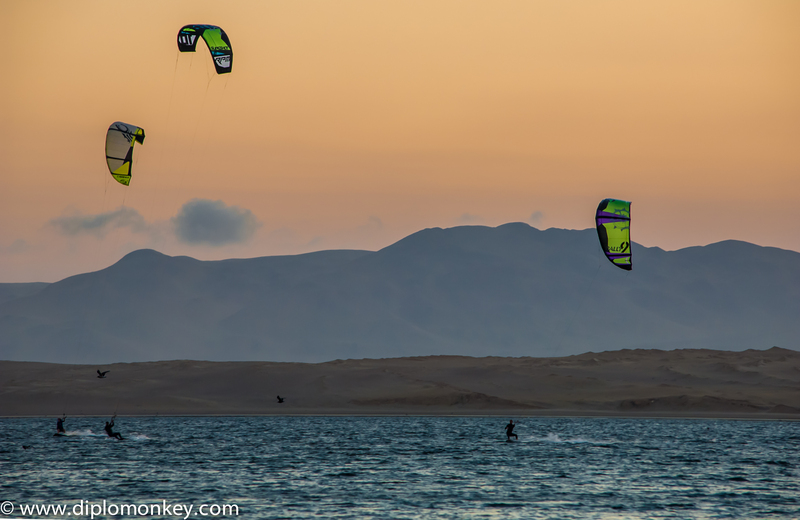 The little dudes, known as the dynamic duo of Zos and Bo (the Bozos) ask Diplomonkey to stay another day in Paracas. Why not? Gives us another day of ceviche, clean air, and a beautifully stark desert landscape by the South Pacific. These sort of days make foreign service life all the better. Gearing up for a sail. 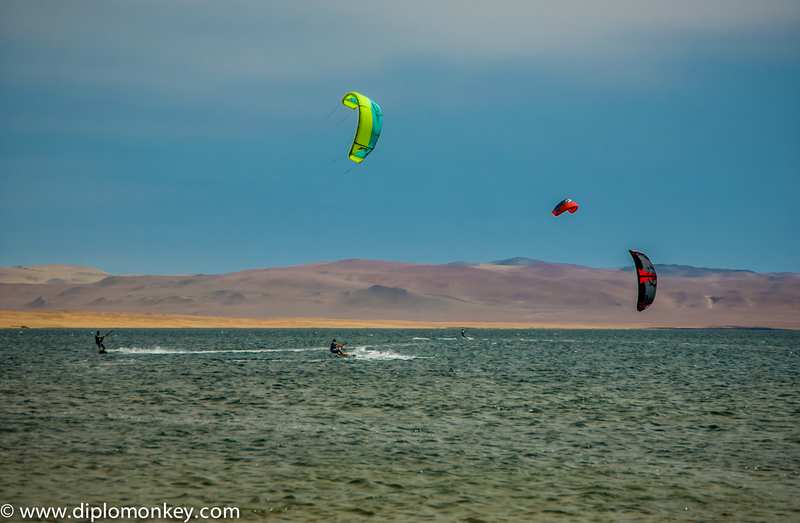 Hope you enjoy the views from Paracas. Come down for a visit, take your shoes off, and have a Chilcano and some ceviche. It has been far too long since I have thrown something out there about Peru; bad, bad Diplomonkey for focusing so, so much on Ecuador of late Okay, so here goes what I think I will start to call postcards from Peru. 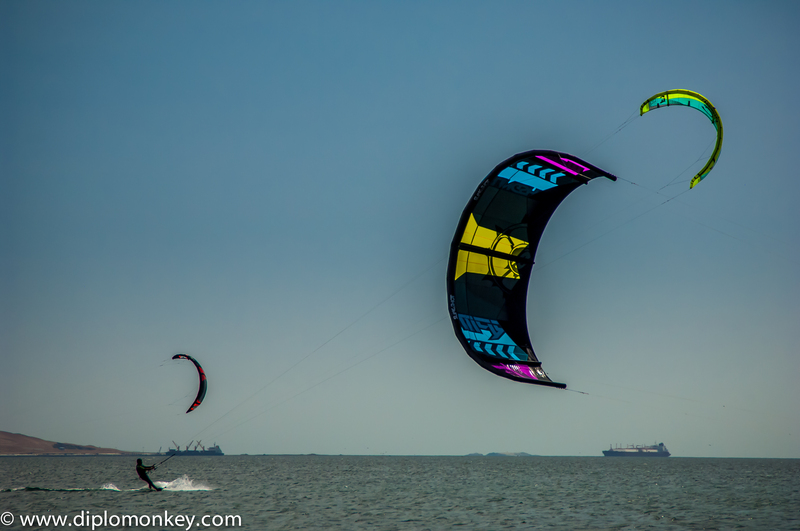 These are the snippets of the life experiences that I am enjoying during my Lima assignment. 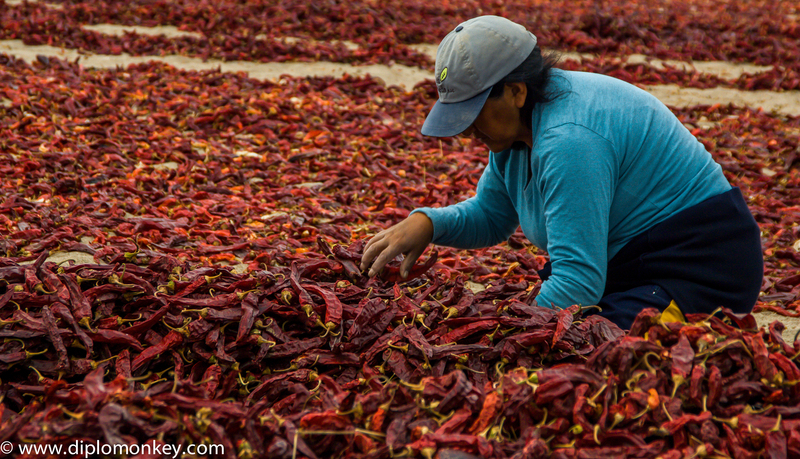 Woman Sorting Paprika by Color and Size. Life in the Foreign Service has its ups and downs of course, but one of the greatest benefit of this career and the lifestyle that we choose, is the possibility to go out and see new and wonderful things. We also get to meet people around the world that we would likely never have any interaction with otherwise. 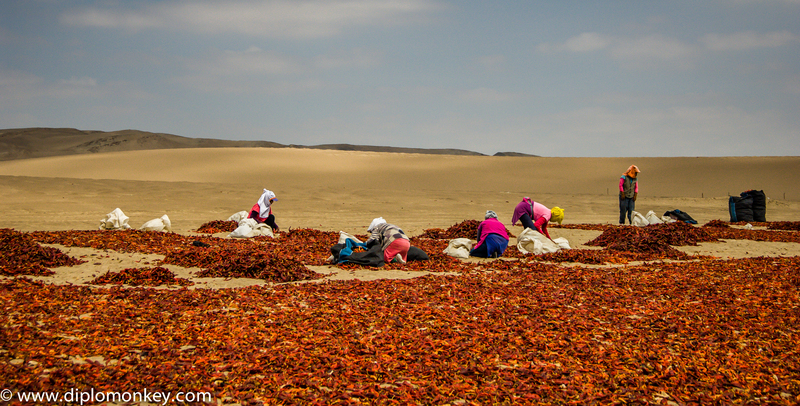 Women Sorting Paprika in the Desert #1. Culture shock: yes little Dorothy, it abounds when we go overseas on a new assignment. We also get to face it, ironically enough, when we also return home to the States. But still it is worthwhile to do this gig, the pictures speak for themselves. 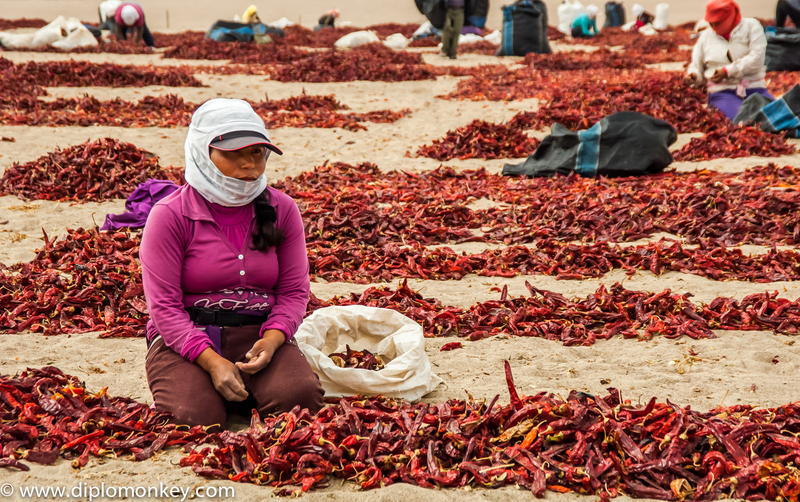 Woman Sorting Paprika Outside of Ica. Enjoy the photos; and next time you pick up some paprika, you will have hopefully a better notion from where it comes. 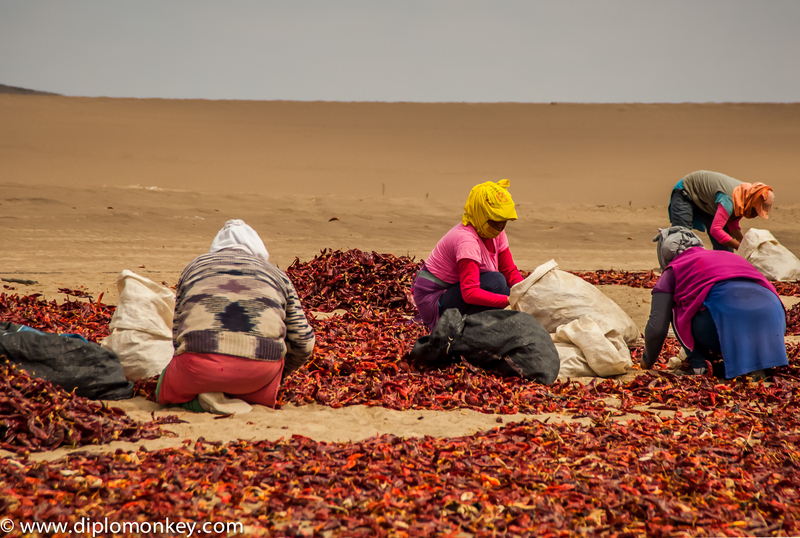 Women Sorting Paprika in the Desert #2.